[AUTO]:[Counter Blast (2)] When this unit is placed on (VC) or (RC), if you have «Royal Paladin» vanguard, you may pay the cost. If you do, search your deck for up to one grade 2 or less card with "Blaster" in its card name, call it to (RC), and shuffle your deck. ...I honestly have mixed feelings about this card. It's a Grade 2 with a subpar 8,000 Power, but it helps the Majesty Lord Blaster deck by calling a Grade 2 or lower Blaster unit from your deck to the field. Obviously, the main thing this will get is Blaster Blade or Blaster Dark unless people are crazy enough to put this in the recently anounced Seekers with Blaster Blade Seeker...but I think I'm stretching that a bit thin. Unfortunately, once that effect is said and done, Star Call is just a regular 8,000 Power unit that'll probably be sniped off or just thrown away as an Intercept, but that's pretty much it after that. Overall, it's an okay card, but I'd prefer Bedivere over this. Welcome to the week where context truly matters. This week we review things purely to bring attention to some hidden gems, or add a few bitchslaps that the cards managed to escape the first time round. So let's start with something that I slowly realized was quite poor; Starcall Trumpeter. When played, you Counterblast 2 to play any "Blaster" unit from your deck. So immediately many people see this as a non-negotiable staple for Majesty Lord Blaster decks because of searching. Hurr durr consistency. 1. She costs Counterblast, so she directly encroaches on Blaster Blade's ability to kill things. 2. Assuming you're using her to set up Majesty Lord Blaster, most of the time you will have to arrange the field in an awkward way, usually only allowing one column to force 5k guard at the very most, or you directly call over Starcall, effectively paying two CB for a +0 wash. Not efficient at all. And certainly, filling the field with Starcall is not something you want to do anyway. Having an open RG circle to call Starcall AND another to call the new Blaster really isn't feasible most games. Plus you'd probably be better off just spending the CB on Blaster Blade for a more meaningful +1. Since, you know, MLB costs -2 to use and Blaster Blade's the best way to make up for it. 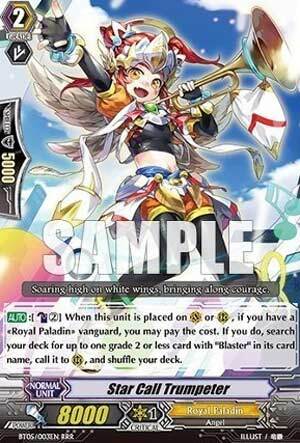 Use better searchers for Blaster Blade and just draw the rest, or Wingal Brave the pieces you need. Just don't use an impractical card like Starcall.